Despite their break-up and Tyler’s abrupt departure last summer, is there something Tyler is keeping from Eden? Are they both as over each other as they thought, and could Eden even begin to forgive Tyler? 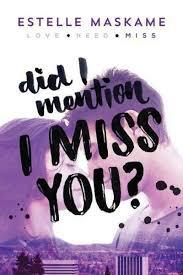 In Did I Mention I Miss You?, the explosive finale to Estelle Maskame’s phenomenal DIMILY trilogy, can Tyler and Eden finally work things out, against all the odds? Estelle Maskame started writing at the age of 13 and completed her DIMILY trilogy when she was 16. She has already built an extensive and loyal fanbase for her writing around the world by sharing her work in instalments on the digital platform Wattpad. Estelle’s writing is now available for the first time in paperback and eBook formats, and Did I Mention I Miss You? is the third book in the series. It’s a safe bet the films will be out by 2017. Maskame’s followers are voracious readers and the Scot has had to grow accustomed to every plot twist being feverishly discussed. Like Zoella, [Estelle] knows a thing or two about self promotion…[the books have] received pretty much universal acclaim from her 125,000 followers. A viral, literary hit! A clever modern twist on the age-old tale of star-crossed lovers. Estelle Maskame: How social media made me a publishing sensation. A new generation of talent! Authors are often advised to write about what they know. Wisely, [Estelle] ignored that advice. She’s only 17, but Estelle Maskame has already gained a global fanbase. The Aberdeenshire schoolgirl has had 4 million hits on Wattpad, signed a three-book publishing deal for her Did I Mention I Love You? series and is still only 17. Did we mention we’re jealous? The teenage writing sensation who used the net to pen a novel set in LA from her bedroom in Peterhead. Despite facing some tough competition within the YA group, notably from the likes of the Hunger Games’ Suzanne Collins, at just eighteen years of age, Maskame has proven herself to be just as worthy of the praise and attention she has so far received, and such praise is unlikely to stop heading her way anytime soon. I was completely enraptured and bewitched…I know people can easy overuse, ‘I couldn’t put it down,’ when describing a book, but in this instance I really couldn’t bring myself to put it down. It was so easy for me to tell myself to just read a few more pages, and before I would know it I had read three chapters. An unquestionable 5/5: it’s a lovely summer read, and I don’t think I can wait to read the rest of the series! So addicting! [The book] had me hooked as soon as I started reading it, I became engrossed in Eden’s world and when I was reading, I was on the edge of my seat half the time, trying to predict what was going to happen chapter to chapter…Estelle’s writing style just flows perfectly and transports you into another world for a few hours. It’s sleek, stylish and does a hell of a lot of justice to the characters and plot. Did I Mention I Love You? is one of the best books I’ve read, and I couldn’t be happier that it’s such a success!